Propagation programs running under DOS were developed for amateurs just after the first IBM personal computers appear on the market. Indeed, it is in 1982 that ARRL "QST Magazine" released the first line of codes of a small program named MINIMUF that delighted the first computer enthusiastics, not very numerous at that time yet. Compared to our current standards, all these precursor programs look of course well outmoded, some displaying only one parameter, MUF in text mode. Hopefully, in less than ten years these programs improved much and were able to simulate the signal and noise models up to request all parameters of a communication circuit and to output as many parameters. If most still displayed their results in tabular forms, some timid attempts were made to take advantage of the first graphic EGA cards to display directly their prediction in line charts or on a colored world map. However, most lacked still of accuracy or displayed their results in low resolution; many used for example very few functions to calculate the F-layer properties or approximate models of critical plasma frequencies. With time the most complete of them were converted to run on the first Windows 95 platforms and some were even translated in Delphi 2005 with a new kernel and user interface. But time running, some authors gave up all support or left us. So, today several programs listed below are no more available. You will be lucky if you find a copy (all are freeware but DXAID). Written in 1996 by Peter Oldfield, and updated in 2002, DXAID is today at version 5.02. This is one among a handful propagation prediction programs using a down-sized set of the IRI model. Its forecasts are statistical, and like all applications based on foF2 data, they are monthly median values. A Help file explains how to use the application and what to expect from its predictions. Input parameters are both home and target location (manually entered or read from external data files), date and time, coefficients to use (Oslo or URSI), solar (SSN) and planetary indices (A, K), QRM level at target location, emitting power, transmit and receive antenna gains. Circuit parameters are automatically saved in CFG files. You can also customize databases listing transmit and receive locations. The format is explained in the help file. DXAID supports also the mouse. 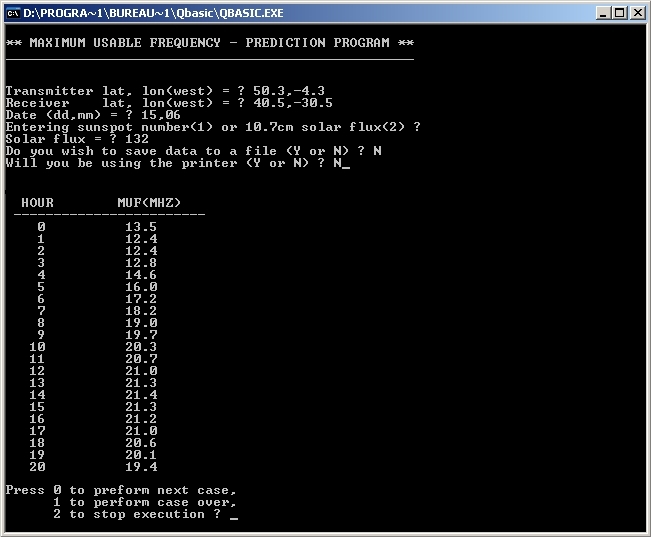 Predictions can be displayed in various maps ("Maps" menu, in equi-distant, cylindrical or polar projection) showing on request and in real-time or using a faster delay (15x or 60x) the gray line, the sun position, the auroral oval, the short or long path, and clicking the mouse of the map the distance and beam heading. The update rate can be set between 5, 30 and 60 seconds. About the auroral oval, note that this event is rarely displayed in amateur programs, and if the NOAA auroral map is given in terms of auroral activity, DXAID uses K-index for the corresponding levels of magnetic activity. At last, a routine called LOPROP checks out areas of the globe that are open to long distance multihop top band propagation, as a function of time. The arrow keys permit to go back and forwards in time. The current map can also be saved in 640x480 16 color PCX format (Alt-S) and recall later. Several tables are also provided. First an astronomical table ("Solar" menu) displays hours of sunrise, sunset, dusk and dawn (astronomical, civil and nautical), the equation of time and sun declination. Then several prediction tables ("Forecast" menu) are calculated for either major broadcast bands (SWBC) between 4.9 and 25.9 MHz or ham bands in spot check mode (selecting a target on the world map) or for the concerned circuit. A bar-graph shows field and signal strengths (in S-unit, dBmV, dBm) and S/N at the target location as well as the transmit and receive antennas takeoff angle and bearing. These tables can be printed on several printer models connected to the LPT port. In Addition, a tool permits to run a calendar, a calculator and to export or import data as text file. DXAID results are among the most accurate available. It was considered as one of the best amateur HF propagation program for years. Unfortunately, created at the time of MiniProp Plus and CAPMAN, DXAID runs in DOS protected mode and uses the EGA Hicolor resolution with all constraints of this environment. For example, a runtime error 207 ejects you from the system if you don't validate the current conditions before to run the forecast ("Forecast" menu, Set Current conditions). But it is as much a programmation error not handled by the system as an user error who wants to go faster than the system in "cutting corners" of the validation process, Hi ! DXAID is available in two DOS versions, one supported by Windows 9x, the other by Windows 2000/XP/ME. It can be purchased by emailing the author in Canada (as of Sept 2004). A new Windows version is under development. Crawford MacKeand is the author of the propagation book "The Friendly Ionosphere". To support the book with practical exercices, in 1996 he wrote this short program, updated in 2001. Short, it is less than 300 KB with all data, it is however one of the seldom application to predit propagation conditions in a spectrum from 1.5 to 45 MHz. But it is still more original that this. SNAPMax takes into account an approximate MF algorithm and gyro-frequency for the top band propagation. In addition, terrestrial reflection points are checked to take correct account of reflection from lands and oceans for ground-wave coverage calculations, and E-layer paths are assessed too. A- or K-index is used to determine polar path auroral losses, as well as MUF depression during storm events. At last MUF is determined using Fricker's algorithms, losses being determined by George and Bradley's method using an internal world-wide vertical absorption map. SNAPMax asks you to characterize the entire communication circuit : the transmitter and receiver locations can be entered either by call prefix or by latitude/longitude. The other parameters are the power, antenna design (isotropic, dipole or beam) and gain, heigth above ground, takeoff angle, mode including digital ones, modulation bandwidth, noise level at target location, multipath delay, almost like a VOACAP model. With all these features included in a so small application SNAPMax deserves well two stars compared to many others, but unfortunately it remains a DOS application displaying its results in text mode. Results are displayed in two simple text charts showing the MUF, LUF, FOT, and noise level across HF bands from 1.5 to 45 MHz (signal strength in S-unit or dBm, S/N in S-unit or dB, and the circuit quality). Noise data for most major countries are also provided. An expanded low frequency scale (2-12 MHz) improves low band displays for NVIS, etc. Path loss is analyzed, antipodean enhancement, chordal hop, short and long paths, giving a graphic breakdown of all noise sources. DOS program running on all Windows 32-bit platforms. First provided as a shareware (version 3) it is now a freeware (version 5.01). This is the first product running under DOS or Windows 95 sold by this company in 1995. This is a propagation prediction and system analysis program using the IONCAP model. In input it requests data of a near-complete circuit and output results in several high resolution graphs. However it heritated of the same inaccuracy as its mentor and its forecasts cannot compete against its main competitors DXAID and SNAPMax (see above), excepting by its improved graphical interface. In spite of its medium accuracy, showing a GUI more user-friendly than IONCAP and its competitors, it became rapidly the interface of choice for many amateurs. After years of good and loyal services, this program was replaced by WinCAP Wizard 3. Developed in 1995 by Pr Geoff West from Curtin University of Technology in Australia, this is an amazing propagation prediction program for DOS establishing forecasts between 1.6 and 30 MHz. Its is based on a report and program developed by ITS in 1969 titled "Predicting Long-Term Operational Parameters of High-Frequency Sky-Wave Telecommunication Systems", the grandfather of IONCAP, hence the quality that comes to light in all input and output screens. From data of a complete circuit, including solar and geomagnetic conditions and data (e.g. locations) extracted from external data files, GWPROP provides a large choice of outputs from the MUF to detailed tables of the system performance along the concerned paths. Even the absorption factor, excess system loss and the electron gyro-frequency are listed in addition to the usual critical frequencies. Outputs can be displayed in tabular or in graphical form, this latter using the EGA Hicolor mode with all constraints of this mode. Printouts are also supported on various line printers as well as on the generic Laserjet. GWPROP uses the arithmetic coprocessor if present. DOS program running on all Windows platforms but denies sometimes to run under XP (but succeeds after some retries). 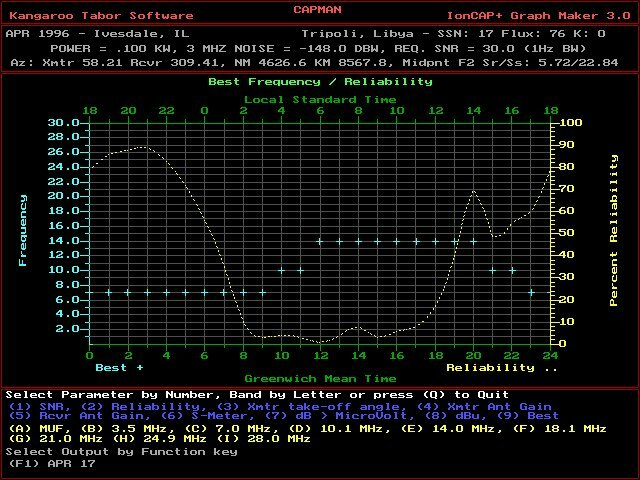 Written by David Ribbins, KY1H in 1989 and updated in 1996, "MOF/LOF Contest Propagation tool" as he prefers to call his program is derived from MINIMUF for the high bands, and a VOA absorption style predictor for the low bands. The author also adjusted parameters from real contest data collected from various locations since 1990. The latest version 2.2 uses A and K indices to take into account disturbed conditions. Predictions can be displayed in rectangular, polar or equi-distant projections at three resolutions up to EGA and in seven color. From a couple of dates the program generates several global propagation maps showing the MOFor LOF. The map can also be overlayed with great circle paths and sun rise position. 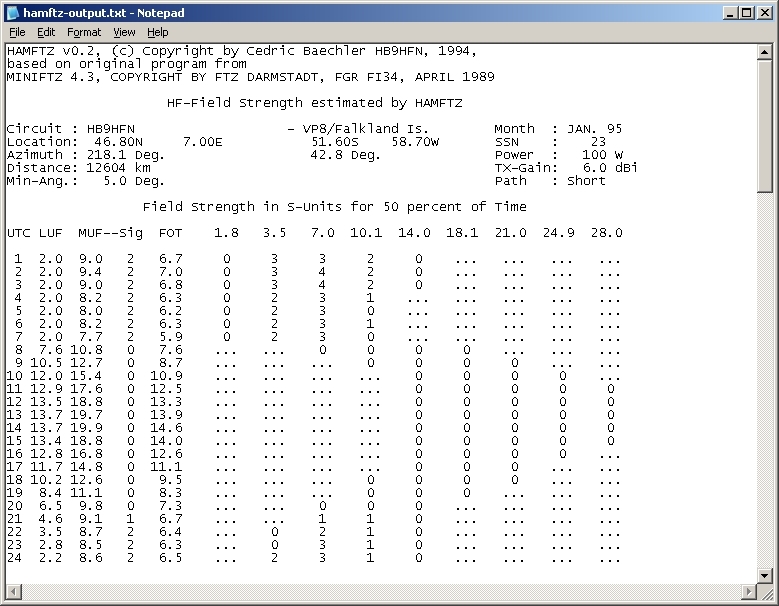 When used with the MMPRINT utility provided by the author for the CT Contest Logging software, MOF/LOF can be used to display the geographical and frequency band distribution of contacts from actual contest data. At last there is a multiple file comparaison routine for which the help of the author is welcome (and suggested) as this function requires specific settings to run under the Windows protected environment. DOS program running on all Windows platforms. Propagation program created for DOS in text mode (version HDX) or Windows 95/98 (version TURBO). Qualified by the publisher of "very sophisticated ionospheric propagation prediction program", it uses however elementary functions and displays all predictions in tabular forms, austere and hard to digest. It takes into account the antenna radiation pattern but without to give accurate results. At the same time, improved ionospheric propagation models were acquired from several sources. In particular, a superior F-layer model based on the F-region method used by Raymond Fricker in IONPRED. The original product was improved and evolved to MINIPROP Plus and version 2. It included then the E-layer cutoff frequency, a gray-line map and an approximate auroral oval. 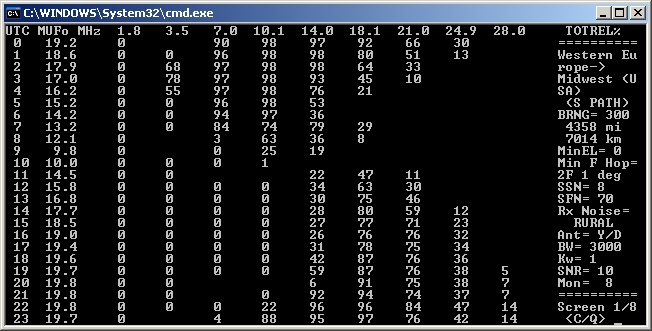 A version was developed for Windows, W6ELProp. Here, the idea is to work up a number of successful modes and then find the one with the greatest signal strength. Written in CP/M, Fortran, RPN, then Pascal, this DOS program runs on all Windows plateorms. Created in 1994 by Cedric Baechleris, this program is based on MINIFTZ 4.3. and uses thus the same inputs (SSN, the time reliability, the antenna gain and power) to calculate the MUF, FOT, LUF and signal strength between two points. It creates two tables, the signal strength in S-unit and modes and takeoff angles. Written in C, HAMFTZ is in a beta program and provides no interface for the input and output ! You'll need an editor to enter the datas needed by the program using the next syntax : "HAMFTZ inputfile outputfile". The output will be written in an ASCII file that you can later read or print. Written in C language, HAMFTZ is compiled with Turbo C++ v3.0 and uses the arithmetic coprocessor if present. DOS program running on all Windows platforms. "PP" stands for Propagation Prediction. Written in 1991 by Bernhard Büttner, DL6RAI, member of the Bavarian Contest Club, major fixed were added in 1992 and updated in 2000. This is one of the seldom program predicting propagation conditions between 2 and 50 MHz. 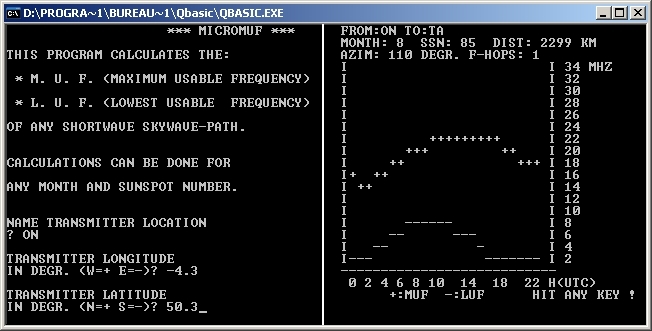 Written for IBM PC and compatible with CGA or VGA screen, this is a DOS program based on MINIFTZ (see below) and calling the data file FTZMUF2.DAT to predict the MUF thanks to a grid point method. Unfortunately it works only in text mode. Ouput can be saved in a text file (PP.OUT) for later printing. The input and output screens are displayed in German (default) or English. Most settings are saved in text files like PP.CFG (user inputs) what overload the input process. From the fundamental data of a circuit, date, home and target location, power, antenna gain, takeoff angle, path (long/short), and reliability (10%, 50%, 90%), PP provides several screens function of the time and frequency (MUF, LUF, FOT, signal and field strength expressed in various units including S-unit). Moving the cursor on curves the field strength can be displayed. 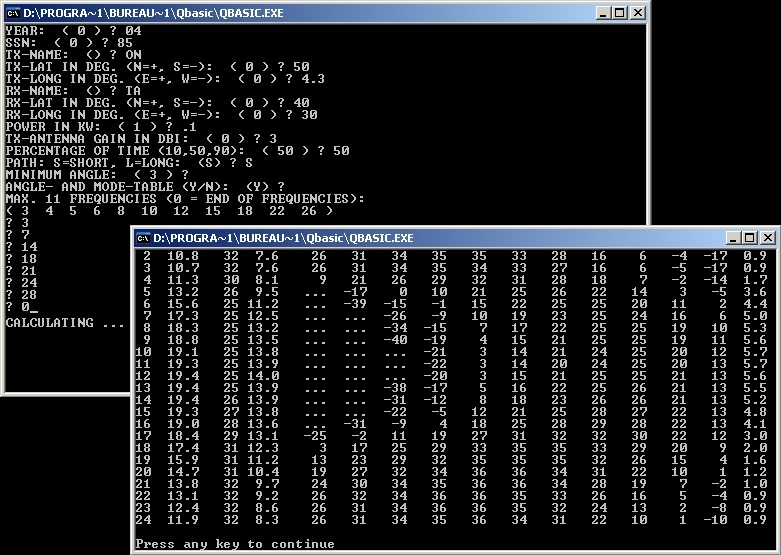 Program written in Basic and converted in Pascal. It uses the arithmetic coprocessor if present. It runs on all Windows platforms. Manual available in German or English. The german FTZ Darmstadt club creates the first MINIFTZ in 1987. It used tables from the CCIR atlas of ionospheric characteristics to generate a field strength prediction for a specified circuit. In 1989 it was improved to count 336 lines of code and call another german program, FTZMUF2.DAT to predict the MUF. As its predecessor, MINIMUF, it uses a grid point method to obtain critical frequencies from the CCIR noise database and uses interpolation to obtain the spatial and temporal data for making predictions. It gives a better representation of the CCIR-Atlas data for 3000 km MUFs than did MINIMUF as it takes into account the SSN, the time reliability, the antenna gain and power. Written in GWBasic (needs QBasic on 32-bit OS) then converted in Pascal, it runs on all Windows platforms. Written at the same time as MicroMUF by Raymond Fricker from BBC External Service, this small program takes into account the role of the geomagnetic field and put in radiation angles as well to calculate the MUF. This modification permit the user to compare MUF predictions for more than just the lowest mode. Mathematical functions are used to simulate the CCIR database, now in the IRI model. Then the functions calculate foF2 at the midpoints of the first and last hops, as in the control point method. Written in GWBasic (needs QBasic on 32-bit OS), it runs on all Windows platforms. No more copy seems available. This a small program of 158 lines of code written in 1984 Raymond Fricker from BBC External Service. MicroMUF calculates the MUF and LUF from the SSN. The Basic version was also converted in Pascal. It was improved in version 2+ by Hans Bakhuizen, Technical Policy Adviser of Radio Netherlands. Contrarily to MINIPROP, in MicroMUF v2 the E-cutoff is associated to the LUF, although the LUF is definitely a D-region matter. It uses Fricker's "mini F-region" algorithm constituted of 13 mathematical functions (instead of only one in MINIMUF) to simulate the database for the critical frequency foF from vertical sounding and L.M. Muggleton's formula for foE calculations. An interactive version developed by Pete Costello for Unix is also availablet. In 2010, Tom Lackamp published the source code and a demonstration shell program of his translation of the original MicroMUF.BAS listing into Delphi 2005. Here is the link to this new MicroMUF shell, and a link to his new program NewLog. This is the very first amateur ionospheric model released in the December 1982 issue of QST vol.66 for the first IBM PC computers. 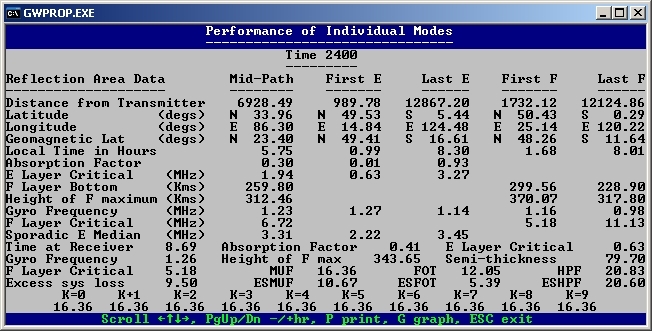 The program came then in the hands of NOAA until version MINIMUF 3.5. This a short program of 242 lines of code with not the least remark that predicts only one parameter, the MUF for HF propagation paths for a specified band, time and day of the year taking into account the SFI or SSN. However there is not correction for the midnight sun and polar night conditions. It includes a F-layer model that relies on only one function and adjusted to represent the results of a limited set of oblique soundings. E-layer cutoff calculations were added to the original code. Its calculation method uses M-factors, numbers between 3 and 4, for division of the frequency to obtain the equivalent vertical incidence frequency for comparison with critical frequencies at about 2000 km from the ends of the path. It achieves this using a database founded on oblique ionospheric sounding. It does not take into account the signal strength or the noise. It works thus best on the highest HF frequency with a very high sun activity and gives misleading or disappointing results in other working conditions. One can also fault the source code of MINIMUF for not taking into account the geomagnetic field, leaving out the equatorial anomaly and organizing the ionosphere only with geographic coordinates. Beyond that, the database is rather limited in scope, its accuracy decreasing for paths longer than 6000 km, distance over which it still gives a rough estimation. Indeed, MINIMUF's F-region map has little resemblance to a real ionosphere on a global scale. That accounts for some of its erratic DX predictions. First released under license ($30 !) it became rapidly a freeware available for GWBasic (needs QBasic on 32-bit OS), Linux and CP/M.